In the fall of 2008, during the early rumblings of the recession, Parsons Dance Company’s board of directors sat around a table discussing the choreographer’s first evening-length work. It was a collaboration with East Village Opera Company called Remember Me. “We kind of all stared at ourselves and said, ‘We’re looking at going forward with the biggest, most ambitious, most expensive initiative ever undertaken by Parsons Dance just as the economy appears to be on the brink of tanking—what are we doing?’ ” recalls executive director David Harrison. “It was at that point that as an organization we made what I believe was the right decision, but also a very courageous decision. We said we’re going to stay on mission.” In other words, they decided the show must go on. Like arts organizations across the country, dance companies suffered a crippling blow when the financial crisis hit. Many are still struggling to stay afloat in what has proven to be the longest economic downturn since the Great Depression. But despite the hardships they faced, some dance troupes managed to weather the storm. They did so by reaffirming their creative integrity and seeking out new ways to sustain it. Whether their success stemmed from taking a calculated risk, making a miraculous turnaround, or just persevering through dire straits, these companies represent the resilience of the art form. In the case of Parsons Dance, the path to a firm financial future was paved by the board’s Remember Me gamble. After green-lighting the costly rock opera, the modern company set a fundraising record for the 2009 fiscal year that paid for the production’s two seasons in New York City, a domestic tour, and the taping of a Public Television special. “When you can look a donor in the eye and say, ‘If you will help us, we can put this show on national television and reach thousands, maybe millions of new audiences and have a DVD to establish its legacy’—people couldn’t wait to help,” Harrison says. Contributions didn’t continue at that dramatic level for long, but donations by individuals have increased 171 percent over the past four years. Harrison credits Parsons’ recent success in fundraising to the new “Campaign for Creation,” intended to cover artistic expenses like studio time, dancers’ salaries, costumes, and lighting design—as opposed to overhead costs. “People want to feel like they’re part of the creative process,” he says. Patrons can even co-commission new works at lower amounts. 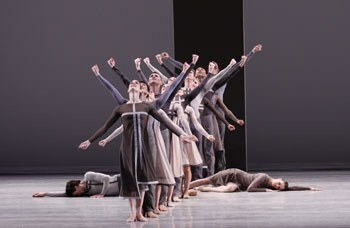 This helped pay for two of the three world premieres the troupe debuted at the Joyce Theater in January. Sometimes the removal of a key artistic element spurs supporters to action. That’s what happened when Miami City Ballet resorted to canceling its orchestra in 2008 due to a lack of funds. The company performed without musicians in the pit for almost two years—until it was awarded a $900,000 Knight Arts Challenge Grant from the John S. and James L. Knight Foundation. But the money came with a catch: The company had to raise half of the award amount itself. Arts philanthropists stepped up to the plate, pledging enough matching gifts to secure live accompaniment for the dancers through 2013. The recession forced some companies to make an even more impassioned plea to the public. In May of 2009, Oregon Ballet Theatre revealed that unless they came up with $750,000 in a month they would likely have to close their doors for good. The company’s precarious financial state resulted from both the bad economy and bad luck: Donations declined 50 percent after the economic collapse, and ticket sales for the prior year’s Nutcracker were devastated by the worst snowstorm in the history of the state. Their lifesaver was a massive fundraising event called Dance United. In just three weeks, artistic director Christopher Stowell put together a gala performance with leading dancers throughout the nation that helped them net $900,000. The galvanizing effort ensured the company’s survival, but it also prompted a series of scalebacks aimed at longevity. The following season Oregon Ballet reduced their administrative staff, staggered performers’ work weeks, and forfeited the orchestra (all of which they are no longer doing). “I believe that collectively people understood the necessity,” says Stowell. “It was painful though.” Stowell also showcased existing repertory rather than invest in new works. As a result of these cost-cutting measures, OBT trimmed its budget by 28 percent and ended the last fiscal year with a slight surplus. “We’re not out of the woods yet. I’m not sure we’ll ever be out of the woods,” says executive director Diane Syrcle. “But we’re well on our way to becoming—and sustaining—a healthy dance organization.” In June of 2010, a year after Dance United, the company reprised the event but on different terms. “It was a celebration this time and not a cry for help,” Stowell says. The triumph of Dance United inspired similar ventures. After conferring with Stowell and others at OBT, Garrett Ammon, the artistic director of Ballet Nouveau Colorado, organized a Moving Together gala last summer to benefit his small troupe based outside of Denver. Again dancers from far and wide participated. “What a huge and humbling thing it was to see that kind of generosity from throughout the dance community,” Ammon says. Ticket sales bolstered finances, he adds, but mostly the performance raised awareness. “It helped get the word out about where we were. It was very grassroots in how it was achieved.” Ballet Nouveau Colorado also tightened the purse strings. One of the company’s 12 dancers left and was not replaced; the number of performances was reduced; senior staff members, including Ammon and his wife, associate artistic director Dawn Fay, took pay cuts; and cuts were made in all areas, including delaying upgrades to office computers and marley floors in the school. With philanthropy down, some groups turned their attention to earning extra revenue. Since Chicago is a major corporate headquarters, roughly $2 million of Joffrey Ballet’s budget comes from corporate donations. When that number dropped by half due to the dismal economy, the classical troupe explored ways to grow their income so they’d be less reliant on contributions. They now have a large merchandising business—on site, online, and on tour—and have begun renting their studios for weddings. “I think you have to have an entrepreneurial culture in the organization,” says executive director Christopher Clinton Conway. Equally important with a volatile market is saving money. Last August, the Joffrey offered a three-ticket package at 61 percent off on Groupon.com. It was the first time a dance company had been featured on the popular discount website, and they increased their subscriber base by a whopping 50 percent. The organization typically shells out $300 to $500 to obtain each new subscriber, notes Conway, which “means that the cost for us to have acquired those 2,500 people could have been well over a million dollars.” After analyzing the Groupon data, the Joffrey found they’d attracted a fresh audience: Less than 2 percent had previously attended a performance. Conway hopes to renew the majority. Some companies benefited from having a bare-bones business model to begin with. The 10-dancer Aspen Santa Fe Ballet employs only five full-time administrative staff members and operates on a modest budget of $3.2 million. “We don’t have a wardrobe person. We don’t have a company manager,” says executive director Jean-Philippe Malaty. “Those are some of the sacrifices we made to put the dancers first.” As a result, there was no one to lay off and no fiscal fat to trim when the economy unexpectedly plummeted. Instead, ASFB responded proactively. “Our ticket sales went down 20 percent,” says Malaty. “What did we do? Most people cut back; we added some performances.” Since the company has two bases, both populated largely by tourists and second-home owners, it was able to produce an encore in each town six weeks after the original program and capture a new crowd at little additional cost. The dancers have a 52-week contract, so they were available, and there weren’t season subscriptions or extensive marketing materials to worry about since the troupe has never had those. “Where our focus turned, more than to the bottom line and the bank accounts, was how to not lose our artistic value,” Malaty says. Elaine Stuart has written about dance for The Wall Street Journal and Time Out New York Kids.